There’s this place in Toronto where people line up for as long as 2 hours (sometimes longer) to buy Japanese cheesecakes. They only allow a maximum of 2 cakes per person and only sell a certain number of cakes per day. So it doesn’t matter if you’ve been in line for half your life on a very cold winter day; if they’re sold out, you go home (crying and/or pulling your hair out optional). It’s gotten so crazy that they’ve set up a Twitter account to announce to the cheesecake-eating world how long the line-up is at that specific point in time. That’s how good their cheesecakes are. However, I’m not really good with line-ups. In fact I kind of hate them. So I looked for bakers in YouTube (I think Baking with Mi is my favourite so far) to see what it takes to make these cakes. I certainly won’t stand in line for them but I will absolutely try to bake one myself. Because Japanese cheesecakes are delightful – not too sweet with just a hint of cheesecake. What makes them so great is the texture. They are unbelievably light, unlike the very dense New York cheesecake that I think we’re all more used to. They are closer to chiffon cakes than cheesecakes really, but wonderfully softer. Making a Japanese cheesecake is essentially the same basic ingredients and set of very specific instructions. I’m a self-taught baker so I have no idea if my technique is correct so all I can do is follow the recipe as best I can, handle the egg whites as carefully as possible, and watch the oven like a hawk. And I am rewarded with a lovely cheesecake every time. My point is: if someone like me can do it then certainly anybody can. PS: The recipe I’ve been using measures ingredients by weight but I know not everyone owns a kitchen scale so I also provided the volume equivalents in the recipe below. I tested the recipe using that (I got your back) and I’m happy to report that version turned out great too (just make sure all your ingredients are room temperature ok?). Don’t let not owning a kitchen scale stop you from baking this (for lack of a more appropriate word) yummy Japanese cheesecake. Line the base of an 8-inch springform pan with parchment paper and grease with oil or butter. Since we're baking this cheesecake in a water bath, wrap your pan with heavy-duty aluminum foil to avoid seepage later. Sift cake flour, cornstarch and salt. Set aside. Remove from heat then add in the flour mixture and lemon juice, and stir until combined. This cream cheese mixture needs to cool so while waiting, preheat your oven to 325F and work on your egg whites. Using a stand mixer with the whisk attachment, whisk the egg whites with the cream of tartar until soft peaks form (you can also use an electric mixer or even whisk the egg whites by hand - just think of it as a mini-workout). Gradually add the sugar until stiff peaks form. At this point your cream cheese mixture should be cool so you can mix in the the egg yolks. Stir until well combined. To ensure there are no lumps, sift and transfer this mixture into another bowl. Go back to your egg whites and gently fold a third into your cream cheese mixture. Add another third and fold. Then add in the rest of your egg whites and fold until just combined. Pour your batter into your springform pan and lightly drop on your counter a few times to release any air bubbles. Put the springform pan in a roasting pan with about an inch of cold water. Bake for 45 minutes or until set and golden brown. Turn off the oven but to avoid cracks, leave the cheesecake in the oven with the door slightly open for another 5 minutes. Then take the pan out and cool completely. Carefully remove the cake from the pan and chill in the fridge overnight to allow it to set. Leave on the counter for about 10 minutes before serving. Did you make Japanese Cheesecake? Tell me how it went in the comments section below. I’d love to hear all about it. There are more cake recipes here. I made the cheesecake today … a half recipe divided among four one cup ramekins. The only thing I got wrong was the top didn’t brown. Otherwise, it was an easy and tasty recipe. Thank you for sharing it. Doing it in ramekins is a great idea! Glad you liked it. I know Instapots are all the rage now so I have started to use my Cuisinart Pressure Cooker (that does all the things the IP does) more often now. One recipe that keeps popping up is cheesecake. Would you recommend doing this recipe in one? Also – 1.. just 1 tablespoon of lemon juice is all the lemon that goes in this cheesecake? I am a huge fan of lemon things – this seems like a very small amount to get real lemony flavor. Japanese cheesecake looks perfect! I have been wanting to try this cake for sometime now. Your recipe seems great, will give it a try soon. I heard it is quite good, though TBH I never really tried because I hate line-ups too! Hope you like this version 🙂 Thanks Charbel! I haven’t heard of a Japanese Cheesecake until now. I would be intrigued to try it out. However, I would definitely search for it to compare. ! Japanese desserts are generally very light and delicate and this is no exception 🙂 I hope you like it Michelle! That looks awesome. I would love to try this. Thanks Cait! Would love to hear how it goes. Is is Uncle Tetsu that you’re talking about in Toronto? Looks like you’ve just saved me a trip! 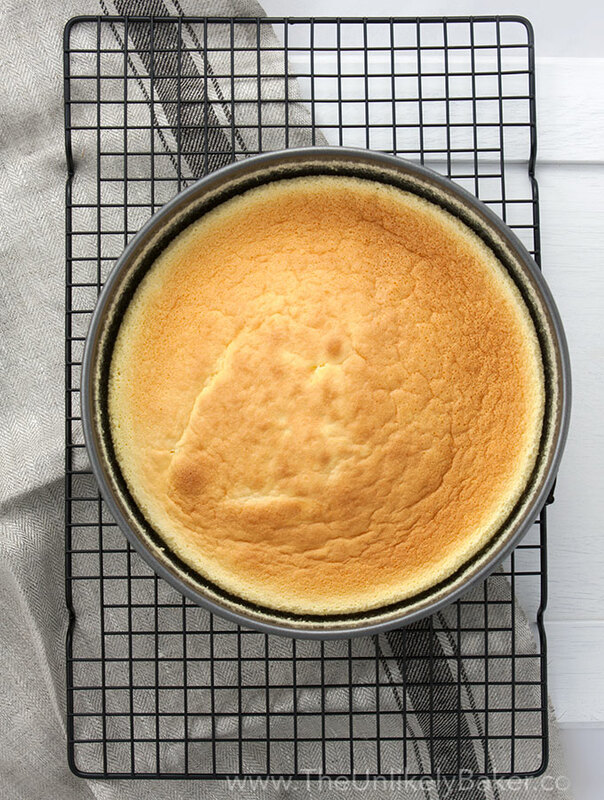 😉 This literally looks like a cross between an angel food cake and cheesecake – both my favourites! I don’t really understand lines like that. But I do understand — and want — this lovely, light cheesecake. It sounds amazing! Oh me too. When there’s “hot” new place I wait until the hype has died down and then I call to make a reservation! 🙂 Thanks Sarah! I am so curious about this. And after reading your story about the 2 hour lines, I have to try this! It’s crazy isn’t it? Hope I got you curious enough to do a little baking this weekend! 🙂 Thanks Raj! Thanks for including the measurements along with the weight! There are so many more advanced baking recipes I’d love to try, but I don’t want to go buy a kitchen scale just for the fun of a few recipes! 🙂 Yours looks amazing! You’re very welcome Nicole 🙂 I find that Japanese desserts are really the only ones I need a kitchen scale for but I thought, hey I’m sure I can measure these out too and I’m so glad it worked! Hope you give it a try. Would love to hear how it goes. I’ve never heard of a Japanese cheesecake but it looks so fluffy! It is wonderful. I actually prefer it over the traditional one we’re used to 🙂 Hope you get to give it a go. Thanks Hezzi! I have never had these before. I’m not sure that I could pull it off! This looks delicious! I can’t wait to try it this weekend. I’ve never tried a Japanese cheesecake, but anything good enough that people form long lines for them, even knowing they may not get one, sounds like something I need get to know! It definitely looks light and fluffy and inviting. Adding to my try-soon list! Right?? I don’t know how that tastes like but this is one of my most requested cakes 🙂 Hope you like it! Thanks Heather! Thanks Krysti! 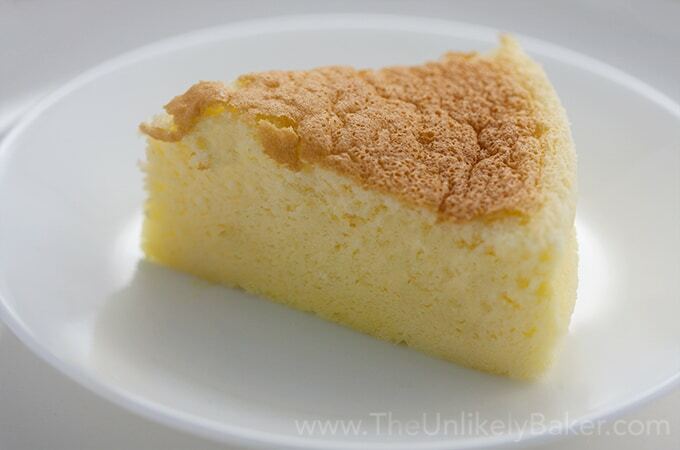 Japanese cheesecake is a wonderful surprise for those of us who are more used to the heavier NY cheesecake. Hope you enjoy it. I would much rather make this at home nice and fresh over standing in line and going home empty handed. Your photos are great, the cheesecake looks feather light and so delicate! 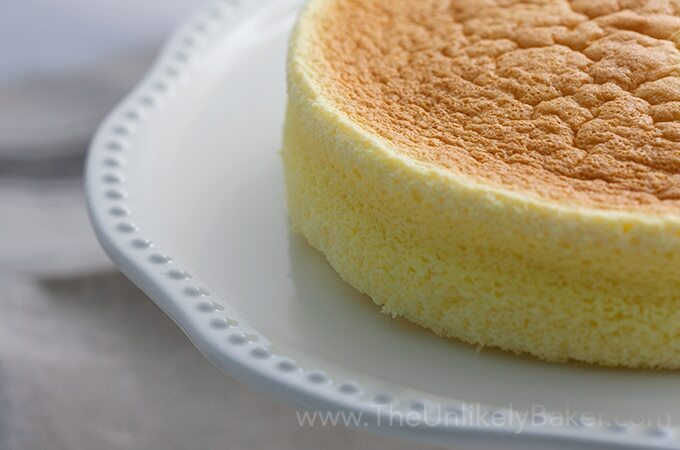 I have two men in my house who are not fans of traditional cheesecake but I do believe they both would love this version, with only 8 oz of cream cheese it is definitely nothing near traditional! What a beautiful cake, and seriously tempting! I’ve always loved these Japanese cheesecakes. Even though Japan isn’t exactly the center of the dessert universe, there’s an exceptional dedication to perfecting a handful of amazing recipes there. Castella, Langue de chat, and of course… light, airy cheesecake. I’d never thought of tackling it myself, but your recipe is wonderfully helpful and detailed. Cheers. I love Japanese desserts. They are never too sweet, always delicate, just perfect IMO. Thanks for stopping by! Fabulous!! 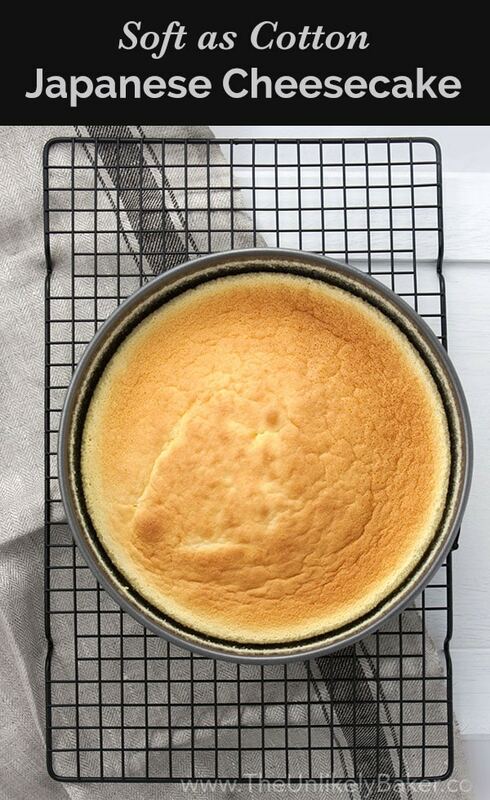 Love the idea of a less dense cheesecake. Will try! You will love how not dense it is 🙂 Thanks for stopping by! Thank you! Hope you try it and like it as much as I do! This is incredible! I have avoided the cotton cheesecake recipes because they honestly scare me a little. Yours came out perfectly! The texture is beautiful! And you do make a good point, sometimes we psych ourselves out of trying new recipes because they seem so daunting, but often, if you just take it one step at a time, and follow along carefully, they turn out great! A late bloomer and an unlikely baker – ha,ha what a great intro. You hit a few nails on the head for me. I really despise New York Cheesecakes, I get all queasy and dizzy and then break out into a cold sweat if I try to eat even a bit of that stuff. I love the idea of a Chinese version although, I’m no baker but with a ‘if I can do it…’ endorsement I think I’m hooked. This is my first time reading your blog and when I saw your name on the FBC thread I actually laughed out loud at the Banana part. So glad I took the time to visit your site. I enjoyed your post. Thanks! Means a lot 🙂 And while I like NY cheesecakes once in a while, THIS cheesecake I can eat everyday…I’m not even kidding! It’s light and soft and not too sweet and just wonderful 🙂 Hope you try it and enjoy it as much as I do! This kind of cheesecake is just great isn’t it? I love it. Thanks for stopping by! Congratulations, Jojo. You made me proud! You’re a very good writer/blogger. I can see you writing your own cookbook someday featuring all the recipes that you tried baking/cooking and the story behind each recipe plus eye catching photos that will leave each reader heading to the kitchen and trying the recipe himself /herself. Looking forward to your next cooking adventure. Thanks Tita Kim! Really appreciate it 🙂 I was hesitant to start this whole project (I didn’t think I could do it) but support from you guys keeps me going! That looks very nice indeed. But to read the recipe I had to highlight the text, so the background was black and the text white, since the font size and the colourfor the text you are using hardly stands out on the page. Those with older eyes will certainly struggle. Hi Geoff. Thanks for your feedback! I didn’t even realize it displayed that light on some screens. I adjusted it now, hope it’s better.